This new method offers a closer, safer look inside live cells. Scientists from the Optics and Photonics group within the Faculty of Engineering at the University of Nottingham have developed a new technique that allows them to see inside living cells at a scale that was previously unachievable. Because it uses sound instead of light, the groundbreaking technique bypasses the current limitations on microscopic imaging. The researchers’ findings are detailed in a paper published in Scientific Reports. The technique can be summed up as essentially a highly specialized ultrasound. High frequency sound waves, sent out by a machine, travel through the specimen until they hit some sort of boundary and are reflected. The reflected waves are then gathered by a probe and analyzed. The time it takes for a wave to travel back to the probe is used to compute the distance of the boundary, and this data is then compiled to create a 3D image of the specimen. “People are most familiar with ultrasound as a way of looking inside the body — in the simplest terms we’ve engineered it to the point where it can look inside an individual cell. Nottingham is currently the only place in the world with this capability,” said Professor Matt Clark, who contributed to the study, according to Phys.org. When trying to peek inside live cells, sound offers significant benefits over light. Common methods of microscopy entail a wavelength restriction, with only wavelengths at least as large as those of blue light suitable for use (the photons of shorter wavelengths carry so much energy they end up compromising the specimen). Sound does not have the same restriction since it stays low-energy even at incredibly small wavelengths. 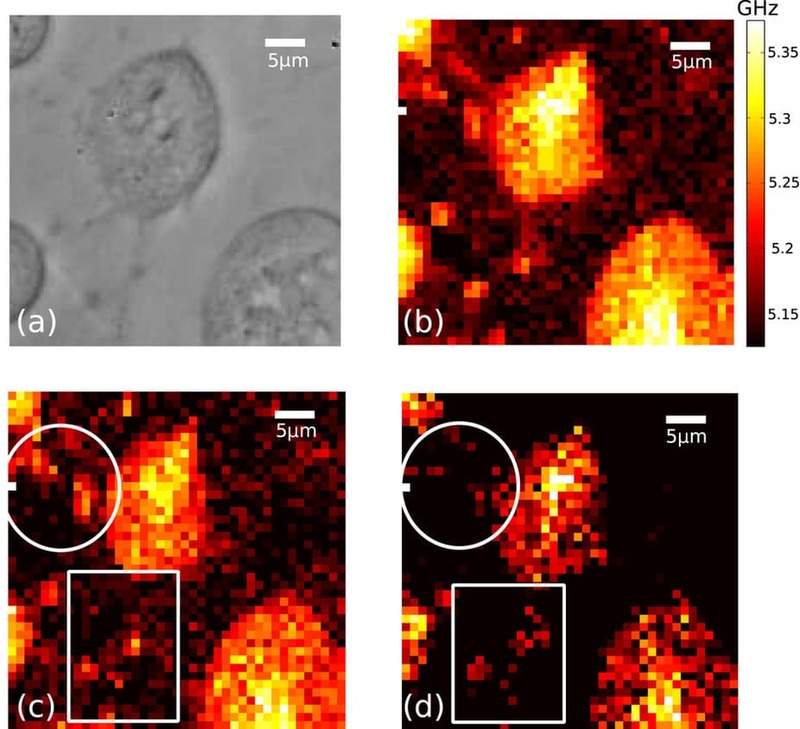 Additionally, optical super-resolution imaging uses dyes that are often toxic to the living cells being examined. Not to mention, that method requires a long time and lots of light energy to gather enough data to create a proper image, and both of those requirements have the potential to cause more harm to the cell. This ability to look within cells that can then be reintroduced to their biological hosts could lead to new treatment options for cellular diseases like cancer, enable us to build more accurate synthetic organs, and perhaps one day even help us better understand (and stymie) aging altogether.